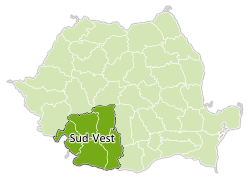 Sud-Vest (South West) or Sud-Vest Oltenia is a development region in Romania. It almost the same area as the historic region of Oltenia. It is called sometimes Regiunea de dezvoltare Sud-Vest Oltenia. This page was last changed on 12 March 2013, at 16:19.